Attendees: Mainly PTs, but one DC as well. Mainly ortho-outpatient based practitioners. Objectives: Not listed anywhere, but the gist was to provide a basic understanding of the foundations of Dynamic Neuromuscular Stabilization including ontogenesis, stereotypical breathing, and reflex locomotion. I have been interested in taking a DNS course for the past three years ever since talking with Charlie Weingroff, Craig Libenson, Patrick Ward, and others about the foundations of human movement. I unfortunately missed DNS Sport in Los Angeles about 6 weeks prior to this course, so I made sure I was able to get to Course A. I had a brief discussion with Dr. Liebenson about the usefulness of this course vs. waiting for Sport (whenever the hell it comes back to the LA area), or even going down to San Diego for Golf Specific Sport. Basically I was not dissuaded from taking A, although the application to my patient population came into question a few times. I knew a little about DNS prior to the course. I knew developmental positioning was used for tests, assessments, and exercises. I knew there was a big breathing component and focus on stereotypical breathing patterns. I also knew that DNS was based off of an already existing concept known as Ontogenesis – organic development. Thoughts: I was pretty excited to just be in a room with Clare Frank, but by the end of the course her approachability and ability to help us come to our own correct conclusions about body positions, what we were looking for during tests, and how to progress tests into exercises made me feel competent and confident in what I had learned, but also left me wanting to know more. Magdelena’s extensive knowledge was also extremely helpful and you could tell that having her teach an A course was like having Motzart play Chopsticks. There was so much these presenters wanted to teach us that was just too advanced or beyond the scope of this course. Day 1 – Mainly developmental positions including tests and a few exercises that could be done in positions like that of a 3-7 month-old. 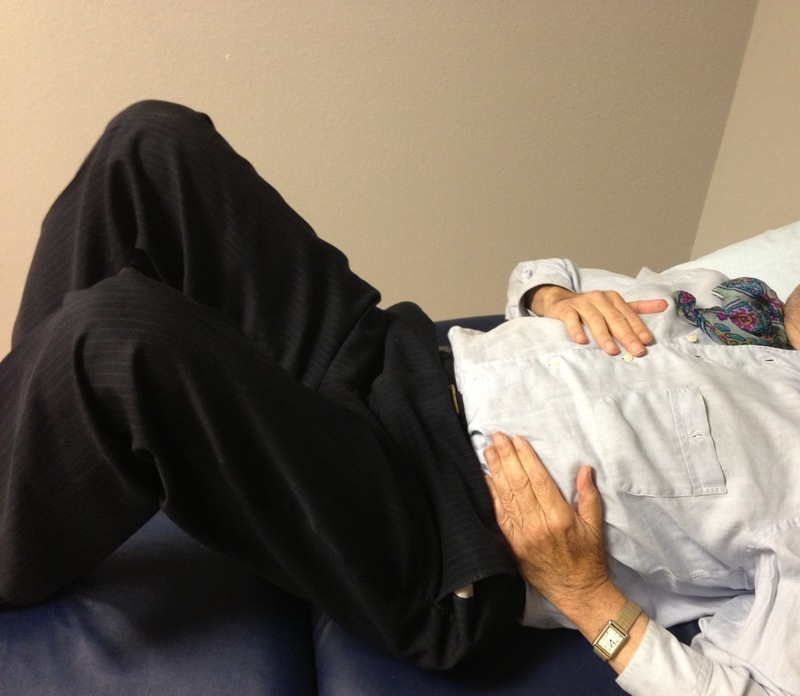 We went through supine, side-lying, oblique sitting, and prone. I was made to look like I hadn’t worked out a day in my life by performing a 6 month-old “plank” on my thighs and wrists. I shook like there was an earthquake occurring in my core. Day 2 – Review of day 1. A couple more positions and tests and then it was on to reflex locomotion. What I thought was strange about introducing this concept to us was that we were told that this RL is not part of DNS. Reflex locomotion uses combinations of primitive reflexes, spontaneous motor reactions, and postural reactions. The problem I had, and others had with this concept is that the presenters showed us what to expect our partners/future patients to do. There was therefore no ability for us to see true RL as we were all biased as to what we should be feeling and doing as example patients. I have attempted a little on patients with at best a hope that it would work, but I have been unable to get anticipated reactions out of them. It is a combination of positions and basically pushing on pressure points/stimulation zones in the attempt to produce involuntary movements that slightly resemble locomotion in supine or in prone. Day 3– All RL and a few more examples of exercises within developmental positions. Take away: Could be a 1.5-2 day course. I think that reflex locomotion should be an optional course if interested. Reviewing ontogenesis was a great part of this course, as well as stereotypical breathing patterns. As Bill Hartman (who was also in attendance) said, these concepts are not anything new, they are just presented in a way that ortho/sports med practitioners think of things. I have been using a lot of the developmental positioning and breathing techniques with my patients over the past month with great outcomes. The patients that I had been plateaued with have been able to progress nicely, and those who have just started therapy find the challenging positions useful and easy to learn for home exercises. As with any course, tool, method, system, knowing when to use it is more important than just knowing it. DNS is now a small part of my treatment repertoire and I will be spending the coming months recognizing situations in which I can use it best. I will definitely be taking future DNS courses, with my main interest being in exercise, sport, and course B. Also, Clare Frank, DPT is a master at her craft. Here is a full length article written by Clare explaining some background about DNS and its uses in athletics.